I’m sure there’s plenty more. How about you? … This new paper from the Lib Dems is exactly how I feel about them! Some improvements, but many disappointments. Many people were excited in 1997 when they too over. I’m afraid I was pessimistic even then. And how about the Labour party? For the sake of balance, after knocking the Tories, I need to talk about Labour too. I have to say that in both Nottingham and Chesterfield they are campaigning hard. They are getting quite a lot of leaflets out compared to what they usually do, and seem to be knocking on good few doors. We’re delivering more leaflets, but then we have more practice than they do. Nottingham Labour’s latest leaflet, a version of which has turned up in many places across the city, promises that Labour councillors will deliver “a newsletter or a mailing” at least twice a year. In long-term Lib Dem wards – one of which has had FOCUS leaflets 6 times a year for the last 25 years, this hasn’t impressed many people. I have to say, that in my direct experience of doorknocking over the last few weeks, the leaflets they are putting out don’t seem to be doing them much good. A lot of people have had bad things to say about Labour nationally. In Nottingham, the issue of the refurbishment of Old Market Square has had an awful lot of people very exercised. I have had a number of people tell me that should Labour knock on their door, their poor candidates are due for a major earful. And yet, there is still a small, and dwindling core of people who will still be voting Labour on Thursday. People who look at you sorrowfully, and say – “I’d like to vote Lib Dem, but we’re Labour.” People for whom the party affiliation is so deep that changing is inconceivable, no matter how far from their beliefs today’s Labour party has travelled. Sometimes I wonder just what would have to happen for this group of people to change their minds. Illegal wars, renewing nuclear weapons, and the rest weren’t enough. Tony Blair eating babies on the Downing Street steps might do it? Have you seen any Tories? A few days ago, I was at a planning meeting which had a strange feeling in the room, which the Tory rep there ascribed in an aside as Labour councillors in a marginal ward seeing the writing on the wall – Development Control will meet next without them, if the Tories manage to defeat them. I have to say, if my experience of living in Tory/Lab marginal ward is anything to go by, the Tories aren’t going to be making many gains in Nottingham at all. I haven’t been watching my letterbox all that carefully, due to being a little busy, but I haven’t seen a single leaflet from either main party during April. As far as I know, no-one has knocked on my door. And no-one has sent me any target mail recently, either. None of my neighbours in my street or any nearby street have posters up for anyone. In Chesterfield, the Conservatives have managed to field more candidates than they did in 2003. They have 9 candidates for 73 seats there. It is a little dangerous to be writing this now, and not waiting til Friday when I will know for sure. But any sign of a mass Tory revival seems to be unlikely from my experience. The last time the Tories were on a wave of success, I am reliably informed, was before I was born in 1977, a few years ahead of general election success in 1979. That was the last time they took power from Labour, nearly 30 years ago. In the major council elections of 77, the Tories held 48% of all council seats. For them to get to 48% again this year, they need to win a further 2,000 seats at this election. That seems a pretty tall order. In order for the Tories to win Nottingham City, they need to get from 7 councillors to 28 in one big jump. That seems a pretty tall order too. They were confident they would do it, just a few weeks ago. I can’t see it myself. We’ll be watching at the end of the week. We have a weekly briefing meeting in Chesterfield for campaigners and councillors, every Sunday at 9pm. It’s going on right now. They’ve all be trooping through, clutching completed canvass cards and the latest bits of opposition literature in their hands. They’ve all very tanned. Which is a good sign. It means that they’re spending every daylight hour pounding pavements. ForecastFox says they’re not going to have such a nice week of it next week! Took this one morning last week after my all-nighter. 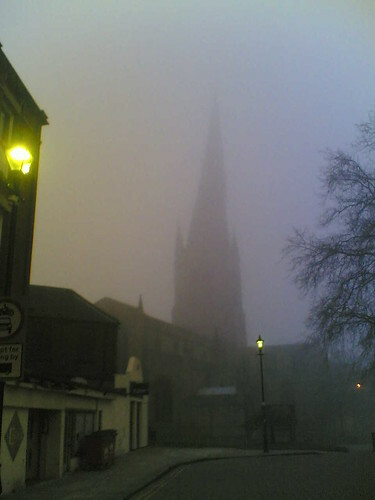 Rather pretty view of the famous Chesterfield crooked spire through the early morning fog. 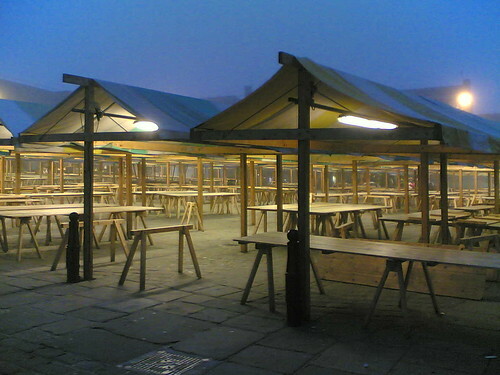 Just as impressive were the market stalls, still almost deserted as at 6am, only the first traders were arriving. The Lib Dem council has recently refurbished the stalls by attracting grant money, and the market is beginning to turn a corner after many years of decline.